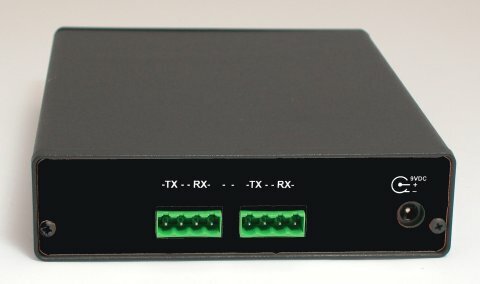 The Data Connect Copper-T is a T1 demarc extension device or T1 repeater. This simple unit allows T1 DSUs, channel banks, routers, and PBXs to be located up to 5000 feet from the telephone company’s demarc. With T1 lines becoming more common in the business and school environment, this is a lifesaver in campus and high-rise environments. 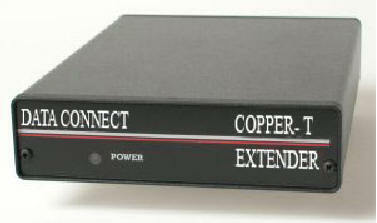 The Data Connect Copper-T is powered by a small wall-mount transformer or optional DC power supply, and is used for connections between T-1 equipment such as PBXs, telco demarcs, T-1 multiplexers, T-1 line drivers, T-1 local multiplexers or any other T-1 equipment requiring long customer owned cable runs. Data Connect Copper-Ts can be used to connect this equipment across a campus, between floors of a high-rise office building or between office buildings with underground cable connections. Note: This product is NOT intended for 10BaseT or Ethernet. T1 modulation is designed for use with twisted pair solid wire phone cables. The Data Connect Copper-T does NOT extend ethernet connections… only T1 connections. For Ethernet Extenders go here. 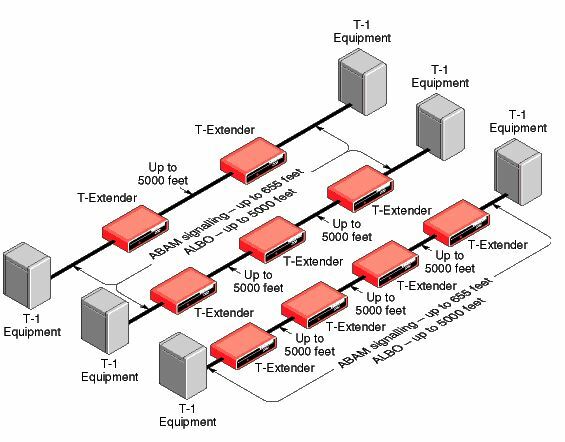 Each pair of Data Connect Copper-Ts may be located up to 5000 feet apart. Solid copper 22 AWG two twisted pair is the preferred cable for connection between Data Connect Copper-Ts. Smaller wire sizes will reduce the functional distance between Data Connect Copper-Ts. Connection to the Data Connect Copper-T is made through RJ-45 modular connectors or 4-wire screw down barrier strips. Both types of connectors are standard on the Data Connect Copper-T. The Data Connect Copper-T is powered by a small wall-mount transformer, and is used for connections between T-1 equipment such as PBXs, T-1 multiplexers, T-1 line drivers, T-1 local multiplexers or any other T-1 equipment requiring long customer owned cable runs. Data Connect Copper-Ts can also be used to extend the distance between any T-1 equipment (DSU, channel bank, router, etc.). The Data Connect Copper-Ts are best used in pairs. If you have a T1 CSU that is limited to 655 feet, connected to a device limited to 655 feet, and you put the Data Connect Copper-T at one end, the Data Connect Copper-T will drive the extra distance. However, the far end device will still be limited to 655 feet and will not likely have sufficient “drive” to reach the far end. The T1 transmitted signal is the issue addressed by the Data Connect Copper-T, so in this case, the line would be error-prone or possibly only work in one direction. DO NOT use Category 5 cable. Proper operation cannot be guaranteed if Category 5 cable is used.